(M35 and M45) The M is a 4-door, 5-passenger luxury sports sedan, available in 4 trims, ranging from the 35 Sedan to the 45 AWD. The 35 Sedan is equipped with a standard 3.5-liter, V6, 275-horsepower engine that achieves 16-mpg in the city and 23-mpg on the highway. The 45 AWD is equipped with a standard 4.5-liter, V8, 325-horsepower engine that achieves 14-mpg in the city and 20-mpg on the highway. A 5-speed automatic transmission with overdrive is standard on both trims. Incredible interior ,great sound and nav.,many safety features. The exterior does not draw attention to the luxury inside.The handling, acceleration and stopping power are awesome.I now find excuses to drive somewhere and look forward to my 35 mile drive to work.I would like to drag race with someone, but I am no longer in high school. As good as Audis, BMWs, and Mercedes but with a solid reliability record. The combination of an extremely advanced 4.5 liter V8 (with lightweight titanium pistons and micro-finished valves) that produces 340HP, 333 torque and the low $36,000 price tag is simply unbeatable. All you need to do to turn this thing into a BMW 545i beater is replace the wheels, tires and springs to bring up the handling capabilities of this car (this is precisely what I intend to do). The car is fast as Hell and that engine purrs with the sweetest whisper. Very fast (0-60 at around 6.0 seconds) and extremely effective brakes -- the Eloctronic Brakeforce Distribution (EBD) brings this beast to a standstill in no time flat and with the addition of better tires, the braking distance should be improved yet. this car is awesome!! Best car for the cash on the market! It has comfort, class (despite what "experts" say) and hp for days!! Looked at new e class and es/gs 300, and they arent even in the ballpark in terms of bang for your buck!! Good Car. Michelin all season tires are do not work in snow. Dealer has refused to provide snow tires. Has anyone goten Nissan to address this safety issue? The Engine, drivetrain, build quality, interior quality, price, drive and handling. Interesting look to some, kind of an ugly duckling to others. Needs a better LCD screen for navigation, need better wheel tire combo. My M45 is awsome. It drives like a larger Benz or Bimmer, but has a more sportier feel. If you are looking at a BMW 5 Series, take a better look at this car! I owned 2 2003 BMW 5 Series, the first was a lemon which I returned, the second gave me all sorts of electrical problems, so I went to my local Infiniti store and tested several cars. I drove a G35 Sports Coupe which was an awsome ride, but too noisy and too street racer. 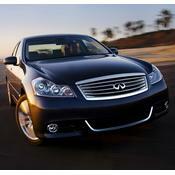 I am glad I waited, because I saved $9K on my purchase because of huge incentives with Infiniti on this car. BMW 530I and 540I both Junk! Turn off the (vdc) "vehicle dynamic control". And watch the 340hp, 333ft pounds of torq, m45 lay down more rubber than a tire factory. Transmison is tricky. Wants to shift to early when engaged in manual mode. "Learn to slap shift fast". Can I saw WOW. I have owned the car for about a month and it seems to impress me even more. I have driven m3's m5's and AMG'S, and my m4.5 litre is just as impresive if not better due it's price hp, and ft pounds of torq. Get's more looks to. Due to the random production. People think it has a bentley / concept lincoln continetial look that is definitly making it's way back to the seen of early retro look. There is no bad styling jugement here I just think infiniti is ahead of there game. BMW M3/M5, Mercedes AMG, E-class ,lincoln ls,cadillac sts (etc). I whole saled cars. Power to weight ratio is awesome though it can shed excess fat. Car has character- not a generic ride, IMO. Only 10,000 of these units are intended for stateside so chances are you won't look like the clone down the street in the Bimmer. Unique front fascia and profile. Solid, easy to modulate brakes. Steering is well matched to engine and suspension. Great, supportive seats- 8 way powered for shot gun seat is needed though. In its price class, it's the sensible choice. For an emotional choice- get a '68 Camaro convertible. These are minor quips and quibbles but I obviously felt they were livable drawbacks in the car: Looks- I can do without the piimp daddy wheels. If the hip hop crowd doesn't latch on to this thing in the next 3 yrs, I might very well renew my lease- yes, depreciation should be a concern given Infiniti's poor track record with depreciation. Car is a little longer than it needs to be, IMO. Can't drive it beyond 7/10ths before you feel like you might wrap it around a tree. May be under-tired. Lack of rear leg room for a car 197 inches long is embarassing. It's the same as an IS 300 for goodness sakes. Audio system is an underachiever. Tire size is really odd as someone mentioned. Parking in SF in the m45 is NOT like parking a Mini. Leave the sedan at home and take a cab or a moped. Awesome car for the money. Due to its apparent controversial styling, buyers aren't exactly busting down Infiniti showroom doors to get this sled. That leaves value buyers like you and me a great deal. The VQ engine is considered one of the finest V8s in the world and is without a doubt the highlight of this car. Big on the outside, rides like a small vehicle on the inside. Ride is firm and compliant, yet not harsh. Gas consumption is in direct proportion to high performance engine. When mfgs choose to give us consumers so many cars to pick from, we're forced to come up with reasons to buy or not buy a certain car based on the criteria that are important to us. Here are mine for buying the m45 and passed on the others: m45 is much less frenetic than a G35 or any of the Acuras... I steered away from the German cars due to all the negative reviews on this site about reliability and maintenance costs. Here in the conforming minded Bay Area-contrary to popular belief; drivers lack the courage to be different. This car gives one many compelling reasons to be different. I spent a month researching my purchase and am very satisfied with my choice. Had put money down on a Acura TSX but realized that the road roar at 75 mph was realy unbecoming of a sports sedan. Felt the G35 fit and finish reminded me too much of a Nissan Maxima. Looked at the is 300 and felt like an overage speedy racer in a suit. Lexus went overboard with the rear tail light design on this car- reminded me too much of the bald headed teenager down the road in his lowered Civic. For 35k, I don't want to be his peer. Is it me or have the Lexus GSs and LSs and SCs gone gauche? Too much of a status symbol in conflict with the bad economy. Performance is bland and styling not aging gracefully for all these cars. Didn't even consider a BMW as everyone who owns a house and has an equity line in the Bay Area has a BMW. Mercedes C class and Audi A4s have questionable reliability issue- like BMW- and like BMW-everyone's got one! Ho hum. RX-8 is not a business appropriate car unfortunately. SAAB Aero was the only car I considered next to this one. Totally different car but IMO, one of the few cars left on the road that has a perfect blend of character in its styling, performance and ride. Again, my decision came down to price to features ratio, reliability and fit and finish and the Infiniti's rear wheel drive configuration. JD Powers rating of Infiniti didn;t hurt. I'm also slightly biased in that I owned a g20 back in the mid-90s and was thoroughly impressed with the entire Infiniti experience. I give little weight to the automobile press' reviews as their car values are typically so different than mine but I'm aware they are not high on the m45. See above. Lived with my brother in law's 2003 Accord V6 for a month while he was out of town and must say it's very competent transportation; Definitely a poor man's sensible BMW with front wheel drive. Power, assembly quality, no rattles, nice paint, nice leather, good dealer attitude. Good displays, once acclimated. Good memory system. Small trunk, leg room in back limited, chrome door handles, design a little much "Monte Carlo". Mouse fur headliner. (Typical for Japanese). Large turning circle. ONLY THREE TIRES AVAILABLE as replacement at Tire Rack. They really picked an "off" size. I dumped my Audi 2.7T because I was becoming scared of it's reliability. Having owned several German cars in the immediate past, I was hesitant to go Japanese, because of the possible loss of 'soul'. But the engine convinced me to give this car a try. It is a screamer, and develops more HP than anything Audi has until you reach $70,000+. I do miss the fold down rear seats and huge trunk and rear leg room from the A6. But the quality of the M is readily apparent, and I anticipate many trouble free miles- more than I can say for Audi. For a big car it handles very well, but not quite up to the Germans. Steering is good. Tires are bad. Front seat comfort and design is fairly good, but again not up to Audi, not is the interior design. This Car is the best I have driven cars for ove 40 years and this is the best car for the money. If you have 2 or 3 people this is car is the best. If you have 4 try a different car, because this car is cramped.